Out my window here in northern Vermont is a winter world of Black & White with nothing much in between unless you count gray… But as February has two Red inspired events (Valentine’s Day and the Red Carpet driven Oscars) I found myself venturing into a foray of party-ready RED, especially on the eve of March… so here we go straight into color! This red dress needs little introduction, for Target did a fabulous job promoting Prabal Gurung‘s recent “Love” collection, but here it is, with a tight bodice, full skirt with side pockets, and a touch of black trim; I danced along with white flurries in a wool crocheted hat and fleece-lined black boots. Vintage lace gloves and a single bakelite bangle accessories spark the fire just a bit hotter! Big red barns, ladybugs and ruby-throated hummingbirds, July’s ruby birthstone and January’s maroon garnets, red cherries, fresh strawberries and sweet watermelon, hot red peppers and red juicy meat, red brick buildings and century old red maples, fire hydrants and fire trucks, a racy red Corvette or rare red Merlot, a sly fox or majestic cardinal, the waxy seal on love letters, stop lights or stop signs, gingers and brassy broads, red lacquered nails and red pouty lips: all as unforgettable and iconic as this lady in red racing across the field of crystal white…right? Looking for a little less fire-engine-red and more little black dress? Well, any opportunity to celebrate is reason enough to slide one of these from your closet hanger: just add a splash of red and you will certainly create the wow factor!! 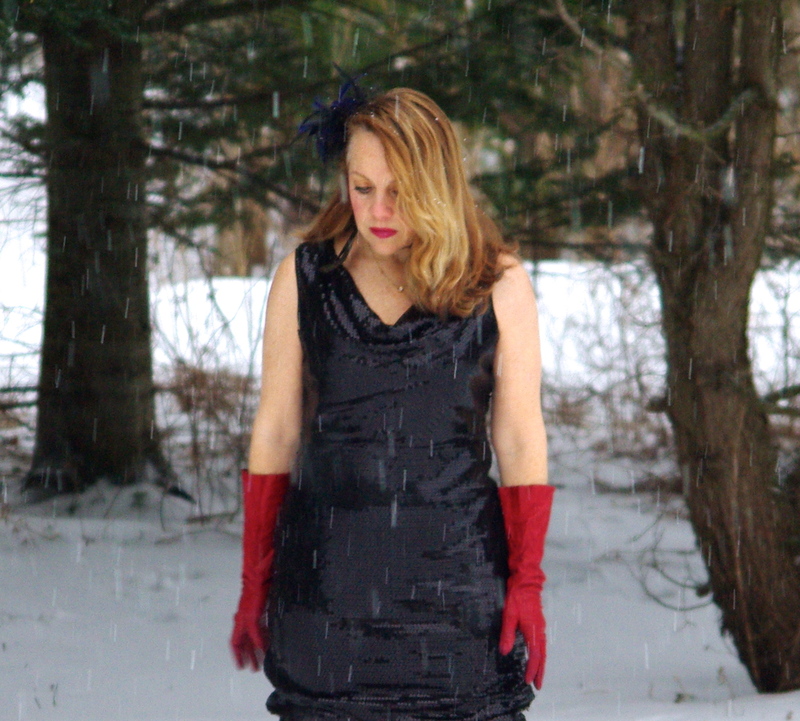 A black sequin dress with a cowl neck and a broad back zipper and plenty of room for curve is just more fabulous with red leather vintage opera gloves and fire red opaque tights. Peacock feather earrings and a plume for my hair just make the look for an evening of adventure. Snow was falling and the temperature hung on the freezing mark but the pulsing vibrancy of red kept our snow-lovin corgi, Miss Vita Sackville-West, and I, on the move! 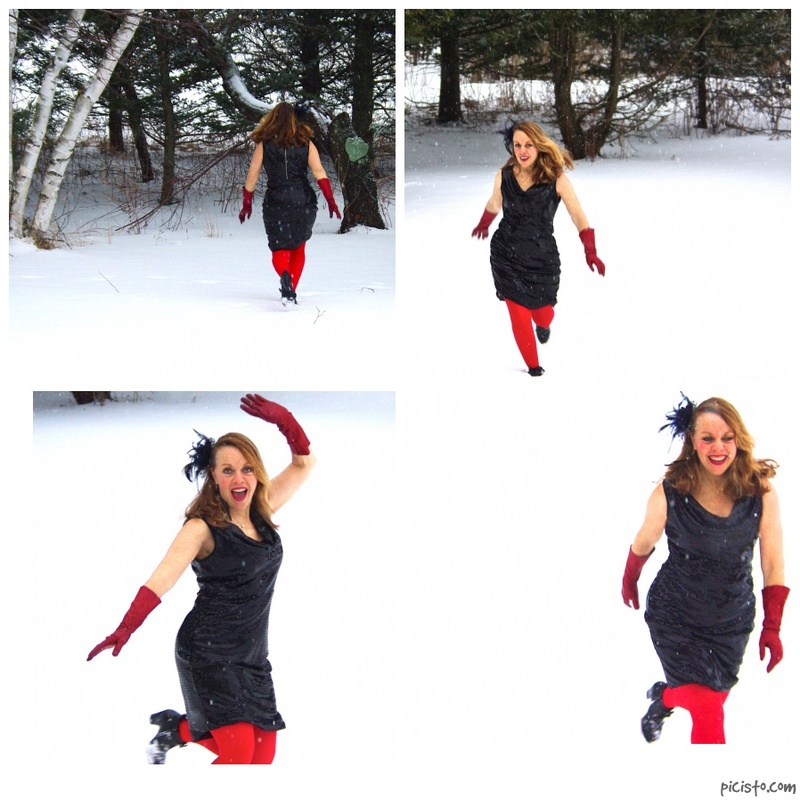 If Vita had her way winter would last all year long despite my longing for spring, yet even I had fun racing about the woods in those splashy red tights! As for make-up, I opted for thick black eyeliner, gold sparkly lids and starlet red lips, as if instead of my prancing about in my backyard I was playing to an audience of 300 on a darkly lit stage… Truly, drama is my middle name! Here’s to the promise that March will herald in color, here’s to the advent of a current of southerly winds, here’s to being ready for Spring coming in as a lion but leaving as a lamb, here’s to the blush of an adventuresome future for us all! You’re a load of fun, Moira. Thanks, fire-engine fun was exactly my goal!! Much thanks to my photographer, who managed to capture all my antics! You look so gorgeous!!! 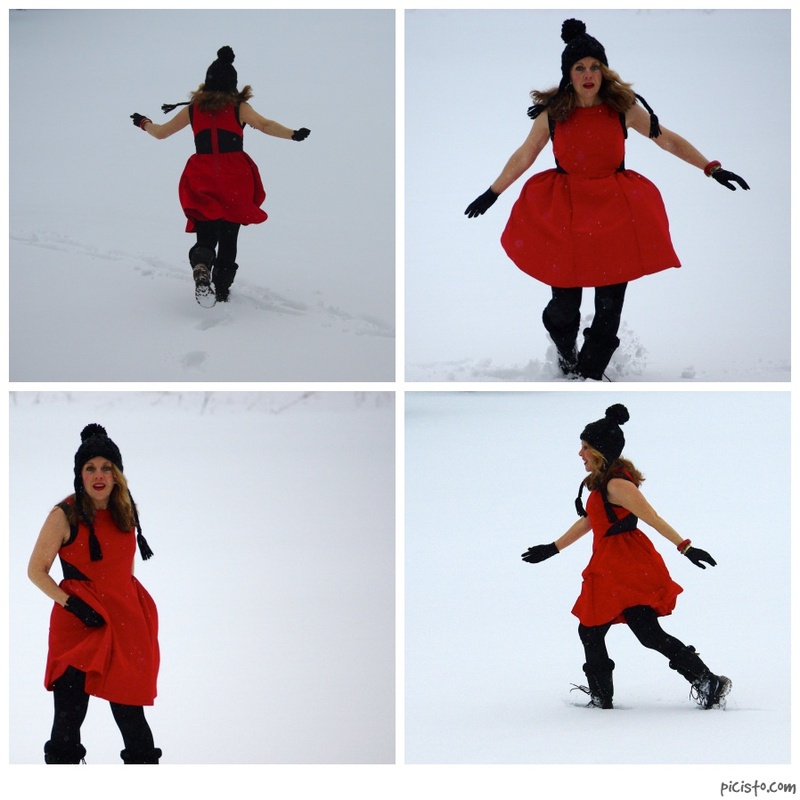 The red/black outfit is perfect in your snowy world. I love it. I felt wonderful! Nothing like spring snow!! 🙂 Thank you so much. I love seeing you having so much fun (and being stylish as ever!). that is what I felt like… minus the ski wear!! …and red is a power color, bold and beautiful! With all the talk of the Pope stepping down, I learned that he wore red shoes…which he had to give up as he left the office, so yes, a very powerful color! You’re funny! That is the sweetest thing in the world to do for your friend Patrick. I read his blog and will send prayers his way. God bless! Thank you… for the compliment and for the prayers for Patrick… both are greatly appreciated!! I kept moving and my photographer shot rapid speed, so I was surprisingly warm! Unfortunately, I can’t say the same for her!! Thanks for stopping by my site! Photos taken a February years ago, but easily could have been today with a foot of new snow covering our yard, and me, out there playing in it. Yes, it is a black and white world, in so many tight and restrictive ways during these cold and forbidding days, but I encourage you to remember the beating heart under it all. Give it your all.